All waste collected within the local government area is sent to various facilities for processing or final disposal. Below is information on where items are taken. 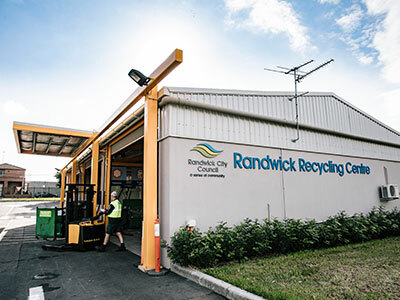 Join us for a tour of the Randwick Recycling centre find out what happens to your recyclables after collection. Learn why its important to recycle right. - Please note the 25 April tour is cancelled (Anzac day). 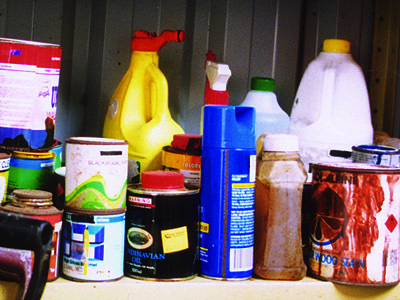 Safely dispose of any unwanted household chemicals found in your kitchen, bathroom, laundry, garage or garden shed by taking them to the Chemical CleanOut event. Ever wondered what happens to all your household rubbish, garden waste and recycling after you put it in the (correct) bin? This is where you'll find the answers. Our rubbish and recycling are collected by a contractor, SUEZ Environment. Council in-house waste team collects garden organics and household clean-up collections. Where does rubbish end up? Rubbish from the red lid bin is taken to the Rockdale Transfer Station and then Advanced Resource Recovery Technology Facilities at Kemps Creek and Eastern Creek. Some additional material is sent to Lucas Heights Landfill for final disposal. Where do recycling and garden waste end up? Recycling is taken to the Material Recovery Facility at Taren Point for processing. Garden waste is taken to Rockdale transfer station and then to Lucas Heights for processing. Ever wondered what happens to your recyclables or general waste after collection? Council offer residents tours of either the Materials Recovery Facility(Recycling) or Landfill (General Waste) facilities, giving residents an opportunity to find out first hand how recycling and waste material are processed. The waste hierarchy is an official list of activities which gives priority to waste avoidance, material reuse and recycling. AVOIDANCE: Buy only what you need and reduce the amount of waste produced by your household. REUSE: Reuse old items (jars are in fashion!) and/or give unwanted items to charities. RECYCLE: Use Council's recycling services to recycle all your household commingled recyclables and garden organics and more. DISPOSAL: This is the least desirable option as items that are disposed off go straight to landfill. There are no current waste-to-landfill operations in the Randwick local government area. Domestic rubbish collected in Randwick, including putrescible or decomposable materials, goes via the Rockdale Transfer Station to Landfill in Lucas Heights. Clean-up waste, which is solid, dry and non-putrescible, is taken to the Port Botany Transfer Station for allocation to other types of Landfill or the appropriate recycling facility. Landfill is at the bottom of the waste hierarchy. Today, strict Landfill guidelines apply. The NSW Environmental Protection Authority, through legislation, license guidelines and environmental protection policies, oversees and monitors Landfill operations. Landfill incorporating putrescible material or waste, including food and other organic materials, ferments, and produces methane gas. Under strictly controlled conditions, this gas can be collected, dried, filtered, burned and transformed into electricity. While such an operation provides some resource savings and reduces the release of greenhouse gas, it is expensive and remains a less preferred waste option. In general, waste disposal in Landfill is environmentally costly and few accessible sites remain in the Sydney metropolitan area. Landfill disposal costs will continue to rise. While Landfill has a part to play in future waste management, it is believed that present dependence can be reduced through waste management planning, new technology and greater consumer awareness and care.